OpenADM: Tools and Framework that enable Autonomous, Self-Administered and Self-Operated functions to a Windows System. OpenOMS: IT Operations Management System based on Mantis BugTracker. OpenSLIM: Simple and Lightweight Infrastructure Manger. 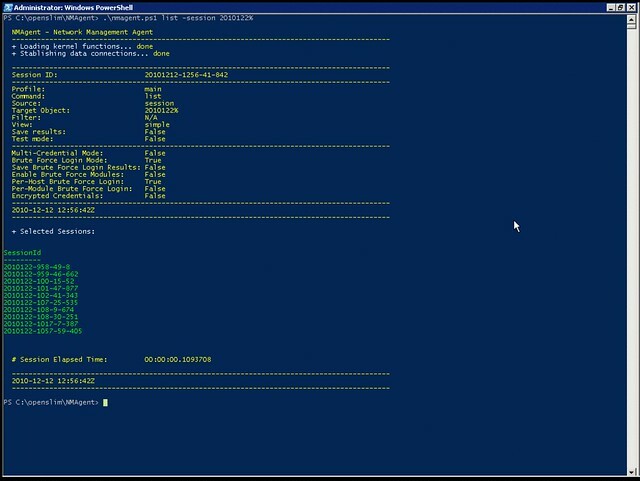 OpenADM is a collection of Tools and a System Framework that provides Autonomous, Self-Administered and Self-Operated functionalities to any Windows System. In fact, it provides tools and specifications to develop, build and operate a legal Windows-based “distro”. Provide a balanced technology-mix in order to deliver good quality, reliable, highly-automated and low cost services. Provide a low-cost, secure and manageable framework for users and IT staff in an increasingly complex environment. Provide a high degree of operational automation. Currently there is no video showing how OpenADM works. But stay tuned this is on my to-do list ;-). OpenOMS stands for Open Operational Management System. 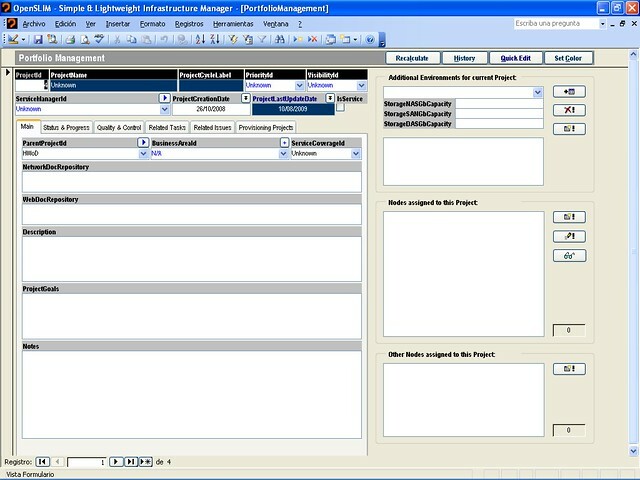 It is a web application focused on activity tracking on IT Project Management and IT Service Delivery Processes. 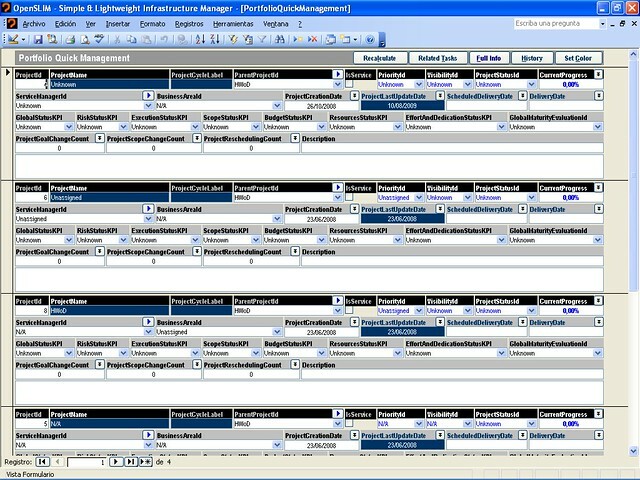 This solution is based on Mantis Bug Tracker and follows the same life cycle that this project already has. Current supported languages are English and Spanish and the semantics of the application are pretty abstract in order to match as much scenarios as possible. However, as an FOSS solution, it is fairly easy to customize and extend if necessary. 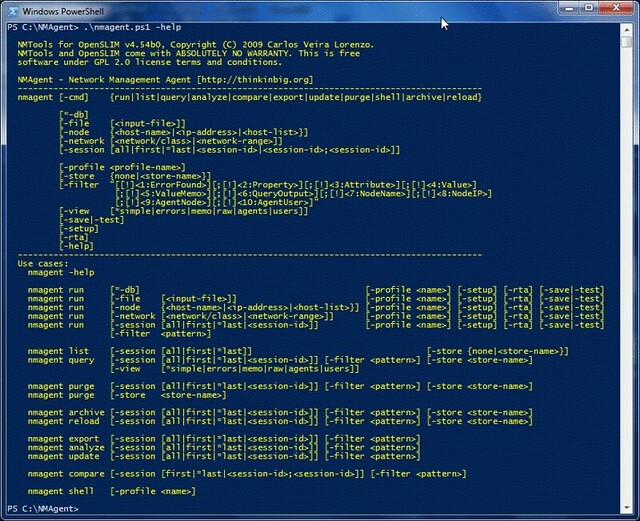 OpenSLIM stands for “Open Simple & Lightweight Infrastructure Manager“. 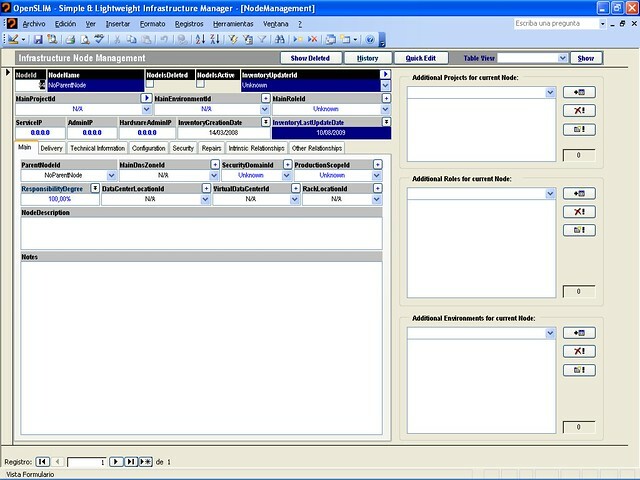 It is a CMDB software with some Infrastructure Delivery and Program Management capabilities. It's main purpose is to be relatively thin and easy to use and federate with other Information Systems. OpenSLIM works with NMTools to extend it's capabilities in areas like Automation, Distributed Configuration management, and CMDB Federation. This way, OpenSLIM does the Information Management processes while NMTools takes care about Distributed Network Discovery, Automation, Data Collection and Configuration Management. The “Network Management Tools” complete OpenSLIM CMDB capa­bil­i­ties with Network Discovery, Data Collection, Automa­tion and Con­fig­u­ra­tion Man­age­ment. Designed for Extensibility, the result is not only a Network Toolset, but a Framework for building quick solutions upon it. Both tools can work autonomously or together: its a matter of choice and circumstances. This solution is based on Microsoft Access, SQL Server and PowerShell. 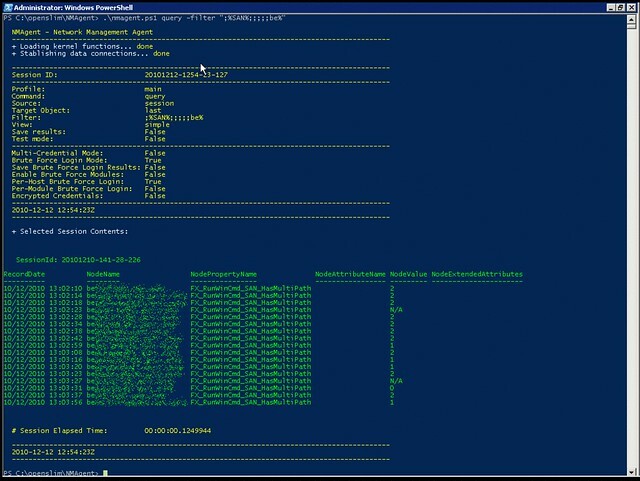 Certain NMTools modules may require third party tools like: PuTTY, PsTools, Net-SNMP, NMap, Microsoft Baseline Security Analyzer or many others. Those dependencies are managed on a per-module basis. Advanced Troubleshooting requires lot of study, patience and dedication. Let’s face it: it’s not easy. But knowing what the tools are and how the process works helps on demystifying this activity. That is why I’ve decided to release my OneNote Notebook on Live.com so that you can link your OneNote 2010 to it or explore it yourself using OneNote WebApp. I would like to warn you that this “discipline” changes a lot as tools, hardware and software evolve. Just take into account that these are my notes from 2010. I will try to keep them updated, but, unfortunately, I can’t promise to. Of course, just in case you you would like to contribute, just let me know. I would love to include your contributions. Maybe we can turn it into a collaborative project! 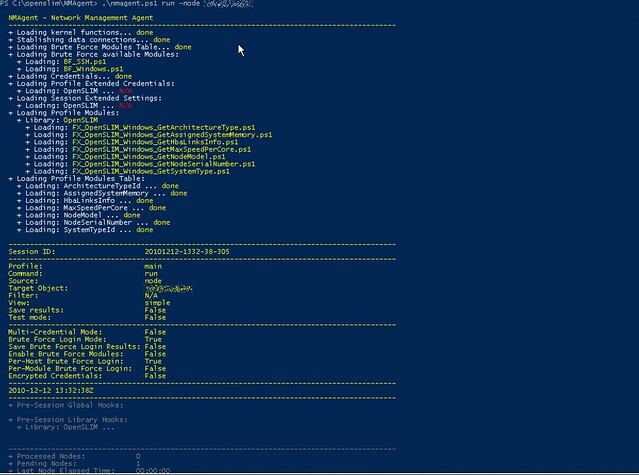 The Social Media Scripting Framework is a PowerShell-based environment that abstracts the complexities of modern Social Media Channels from the PowerShell command-line. This enables any regular user (arguably, a ‘power user') to leverage the content, connections and relationships of those channels in a completely new way. Web technologies work nicely as User Interfaces. However, the aim of this project is to explore the possibilities of a new ‘form factor' for consuming and exploiting ‘social content' and ‘social relationships' in a decentralized and cloud-independent way. This Framework is not for software developers, although they could actually enjoy it too. In fact, it provides easy to learn abstractions and constructs so that any user (arguably, ‘power user') can play with the ‘Social Universe' and connect it with his/her information store of choice in a convenient way. In other words, empowers the ‘Information Worker 2.0' with new tools and capabilities to develop his/her work. Series of Mind Maps that I have developed while I was preparing my certification. I have translated the books (TOGAF 9.1 and 9.2) into a series of interconnected mind maps. There, you will find, not just the structure and the key elements of each topic, but also links going back to the original sources, embedded diagrams, notes, and other online references..